Sitting in a commanding position overlooking the city, a church was founded here in 1143 by David I, although there is evidence of an earlier church dating from AD 800. The present building was erected in 1815. Designed by James Gillespie Graham, it is a rectangular semi-Gothic building with corbelled parapet tower. A memorial stained glass window to Major-General Andrew Gilbert Wauchope, depicts Cornelius, by Ballantine 1905. Three striking contemporary pulpit falls and four outstanding wall hangings by D Morrison. The kirkyard contains many stones of special interest, including a table-top tomb to a local farmer, its ends carved in relief with agricultural scenes. 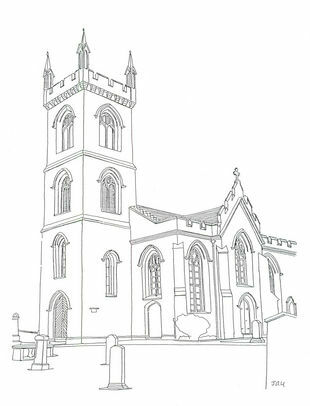 Liberton Kirk has a large amount of genealogy records from 1630, including Baptismal, Marriage, Death, War Service, 1693 Poll Tax,and Census Records of 1841-51-61-71 and 1881, all available to view. We also have complete transcripts of the Churchyard stones. For details, contact Mr John Rennie using the ‘contact this church’ box. Liberton Kirk is a Destination Hub on the St Ninian Pilgrim Journey.